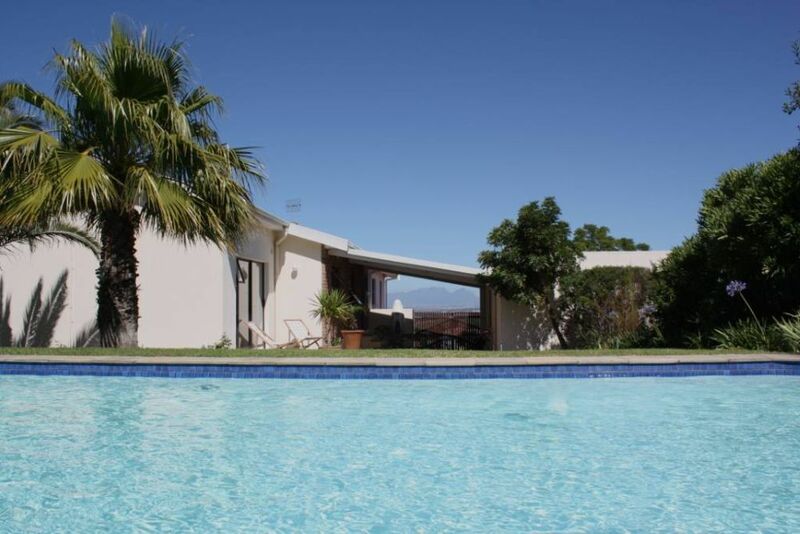 Villa maximum 6 adultes + 6 enfants, vue impressionnante mer et Table mountain. La maison est Idéalement située , avec un magnifique jardin bien arboré, une piscine exceptionnelle chauffée au solaire de 15 mètres de long par 5 mètres de large. Elle est située en haut d'une colline , d' où cette vue imprenable. Le quartier est très calme . La maison présente tout le confort nécessaire et est parfaitement équipée. Vous y aurez des vues d'exception sur mer océan indien (False Bay), la Péninsule du Cap et Table mountain mais également sur les montagnes de Helderberg . Vous serez au départ de la route des vins et pour rayonner dans tout le Cap occidental. C'est également une destination pour golfeur avec une trentaine de parcours dans un rayon de 50 km. C'est la maison parfaite pour des vacances inoubliables . La plage la plus proche est celle de Strand (environ 5 km ou 10 mn en voiture ), plage surveillée avec zone baignade, surfers, kitesurfers et véliplanchistes. Température de l'eau entre 20 et 26 degrés en été. Somerset west est sans nul doute la destination qui monte de par sa localisation géographique exceptionnelle. .
Des commerces de qualité tout proche. Les accès autoroutier également . Très belle pièce séjour-salle à manger avec coin cheminée, très grand balcon vue exceptionnelle, 3 chambres doubles + un dortoir 40 m2 au sous-sol capacité 6 enfants ou adolescents (lits-tiroirs).2 salles de bains wc-douche+ un wc indépendant. Magnifique pièce de séjour avec salle à manger. Je suis commerçant, mon épouse expert comptable, j'ai 3 filles que j'aime. Je suis fan de golf et de sports nautiques. J'ai acheté cette villa sur un coup de foudre lorsque je me suis rendu en Afrique du sud pour la première fois en 2002. Ce pays m'a conquis .En attendant de m'y installer peut-être définitivement , j'ai décidé de louer ma villa . Un emplacement absoluement exceptionnel sur la carte du Cap occidental. Le confort d'une maison de propriétaire. Située en haut d'une colline, avec des vues magnifiques sur mer et montagne. Environnement extrêmement calme. Un espace jardin avec piscine d'exception à l'arrière de la maison pour une discrétion assurée. Toutes les salle de bain sont équipées de lavabo , douche et wc. Fonctionne particulièrement bien. Ne pas oublier d'ouvrir la trappe . Sur place nous mettons à disposition une clef WIFI . Rechargement par achat de crédit dans les points de vente Vodacom . Une grande serviette par personne . Pour vous être agréable quelques serviettes de bain dépareillées à usage piscine vous sont laissées à disposition . Très beau salon avec mobilier de style bois foncé. Servez vous de ce que vous trouverez en fonds de cuisine laissé par le précédent occupant et remplacez si possible. Tous les accessoires nécessaire pour cuisiner sont présents . Nous même propriétaires adorons faire la cuisine . Belle vaiselle. Abonnement de base avec le minimum de chaines. Tout client pourra à sa charge "upgrader" l'abonnement . Petite chaine Hifi installée en cuisine .Quelques CD sont mis à disposition. 150 m2 avec arrosage automatique . Magnifiquement arboré. Très grand balcon sur la partie avant de la maison d'environ 30 m2. Vue imprenable sue False bay et la péninsule du Cap. 4 chaises longues en métal noir avec toile grise. Je laisse mon VTT à disposition . Merci de ma le laisser dand le même état que vous l'avez trouvé . Terrasse à l'arrière de la maison avec 2 chaises longues . 7 transats rangés dans le garage . Si vous les utilisez dans l'herbe, pensez à les mettre à l'abri la nuit à cause de l'arrosage automatique. Piscine de dimensions exceptionnelles : 15*5 mètres. Chauffage solaire en toiture. Malgré le chauffage solaire ne pas compter se baigner en juillet, Aout sauf pour amateurs d'eau très froides. We stayed in the house for almost 5 weeks and greatly enjoyed our time there! The owner (Emmanuel) is very friendly, helpful, and responsive, as is the property manager who met us when we came in and left. The views are incredible, with very clear views of Table Mountain and False Bay. The location is very good - ~30 minutes or less from most everything we wanted to do (eg, vineyards, family activities, Waterfront), and 10 minutes from malls with everything you will need. The neighborhood feels safe, and the field in front of the house has avery nice play area for kids. Only 2 things, really, kept this from being perfect: the floors have a dust/dirt that doesn't go away, as noted in another review. We dealt with this with sandles/flip flops. Also, as we were there in early spring, it did get quite chilly at nights. Each bedroom has heating/AC units, and there is a fireplace (although we didn't use it since we had kids with us), so sleeping is comfortable. We stayed in the house for 1 week and we really enjoyed it. The owner himself was not there, but he sent a good friend (Brian) and he was very friendly and could answer all questions we had without any problems. All problems are fixed more then promptly, we had a defect on our door and only a few hours later a craftsman came to fix it. Especially the pool (15 m long) is a highlight, we used it quite often and also late in the evening it is still warm an invites for some glasses of champagne for sundowner. Another highlight is the view from the front of the house, great to enjoy the sundowner and view on false bay. The house offers enough space, we stayed with 4 adults and used 3 bedrooms, another large bedroom can be found in the souterrain. In general the house is in a very good condition, only the bathrooms seemed to be a bit older, but Emmanuel has already started to renew it according to our last information. We can recommend it for a larger group of people as there is enough space. Our first impression on arrival was, we saw a big 'FOR RENT' sign on the front of the house. However, the swimming pool was fantastic and the location most convenient for touring around the Cape Town area. The house is advertised as sleeping and seating for 12 guests, luckily there were only four of us as there were actually only two sun loungers and three sofas. i) a Housekeeper included - not true, the house was dirty especially all the floors, which we ended up washing ourselves and there was no bed-linen or towels change between the first and second weeks. v) Fitness room and equipment - not sure where this was??? vi) Wheelchair accessible - there are four very steep stone steps up to the back door which are completely unsuitable for a wheelchair, I am very glad I did not require one and it would be most difficult if you arrived expecting easy access. As I said the overall holiday was great for four adults, but we paid a lot of money to stay in good quality accommodation which sadly fell slightly short in a number of areas. I hope the owner can address these for future visitors. Outside, in the back garden , the terrasse is only equipped with 2 sun loungers as the terrasse is not big enough to accept more sun loungers. What you call sofas ( transat) , I must precise for ouside , 4 more of them are stored in the garage where customers have access . i)Housekeeper included: The house cleaning is made before every check in by a cleaning company which has been working with me for 2 years. I am sometimes here when the cleaning ladies are working . I never had to complain about them. The floor is made of tiles with grey cement join. If you walk barefoot , true that your underfeet get colored. I never mentionned that there is a set of change for bed linen and towels . ii)Internet is ticked but it is mentionned that Wifi works with a rechargeable key that guests have to charge with bundles in Vodacom shops . iii)Shower rooms: They were cleaned... it is true that the white grout between the tiles is a bit damaged in some areas . I restore it as much as possible once a year . iv)TV channels are limited to basic contract . Guests can upgrade it by themselves if needed. vi)Wheelchair accessible : One guest in the past absolutely wanted to rent the house with his disabled daughter . I made a wooden ramp to climb the 4 steps with a wheeling chair . He was happy with that . Considering your comment I will simply tick it off . We've spent 4 weeks in this very nice villa. The owner Emmanual is a very friendly and helpful person answering questions promptly. We were 4 adults and one 3 month old baby (Emmanuel bought a baby bed for us). The pool is very long so you can take a real swim also in the dark as you can turn on lights in the pool. It is cleaned weekly and you can choose the water temperature (we like it warm around 28 degree). Very enjoyable! The kitchen is well equipped with a nespresso machine and milk foam maker (nespresso store is in the Victoria wharf mall in Cape Town) and everything you need. The main room has comfortable sofas and a big balcony facing to False Bay and Table Mountain- we've enjoyed having a sun downer and this outstanding view every single evening- breathtaking sunsets!! The neighborhood is quiet and the people around friendly and helpful- there is an alarm system which we only used when we left the house. We felt safe. The location is perfect for having lunch at the wine estates around in app 15 minutes distance and trips to Cape Town app 35 min to the water front. In Somerset is the award winning Woolworth at waterstone mall and the big Somerset mall where you'll find anything you need. We really enjoyed our stay and can strongly recommend to get in touch with Emmanuel in order to spent time in beautiful SA in his house. De l'Aéroport de cap town, prendre la N2 direction SOMERSET WEST, prendre la sortie Numéro 38 FIGROVE M9 MACASSAR road. Au bout de la sortie , prendre à Gauche. Au 1er feu prendre tout droit M9 HELDERVIEW. Passer sur le pont. Environ 800 mètres après le pont , tourner à Gauche R44 RAITHBY. Faire 50 mètres et tourner à droite M156. Faire environ 2 km sur cette route qui monte à travers les vignes . Au 1er rond-point aller tout droit. Ce sera la 3ième rue à Gauche. ( attention les rues sont indiquées sur les rebords de trottoir au sol). Somerset west est devenue une destination de prédilection pour les étrangers qui souhaitent visiter la région du Cap. Une situation géographique idéale pour découvrir la région du Cap Occidental qui mérite largement un séjour de 2 semaines. 30mn en voiture du Cap, 15mn de Stellenbosch, 45mn de Franshoek, 1H15 d'Hermanus.